Before the end of the year make sure every member of your team has had an appraisal and their development reviewed. Set targets for the year ahead and discuss any concerns or issues from both sides. Record all meetings so you can refer back if needed. This will also protect you legally should there ever be a dispute with an employee, and you have kept a full record of contact and discussions. Performance review software can help you to manage this process, try a free 14 day trial of our PDR Cloud system. 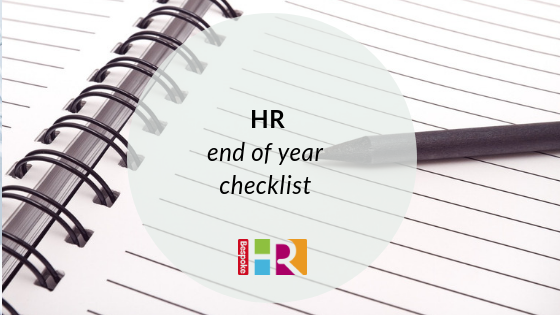 Have your staff fulfilled their training objectives and needs this year? If not, you still have time to complete this before the end of the year. Allocate funds and resources now for staff training in 2019 so that staff are clear on what’s available to them for the next twelve months. Read our guide to setting up a training scheme if this is something you haven’t done before. With GDPR now in full force, you should conduct an audit now of the information your business holds on employees and job applicants to ensure ongoing compliance. There is lots of useful guidance on GDPR available on the ICO website. From April 2019 auto-enrolment contribution rates will rise from a minimum of 5% to 8% of earnings (which means 5% from the employee and 3% from employers). With nearly 10 million people using the scheme, now is the time to communicate this change to staff. Read our guide on the changes. For advice on any of the above, take advantage of 15 minutes of free HR advice.